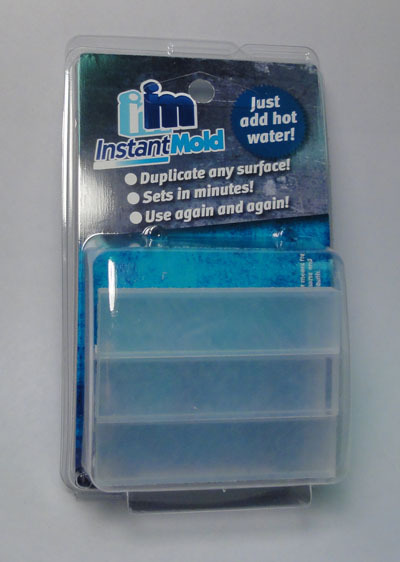 After watching some demo videos and hearing people talk about how well it works, I just ordered a pack of Instant Mold. and how does it work..can it be used for hot or cold casting ? sorry 3 questions..how big an object can be molded with it? Yes do tell, I could be interested in that, too. My friend Greg used a similar product very successfully. Their are several vids on YouTube done by a guy doing 2 part molding,and he does some fairly large pieces by combining several sticks.I wouldnt think you could do any more than one=offs,unless you can get green stuff or similar cheaply. They state you can even use super glue as a molding compund,but I'd have my doubt about that. 1.) I got it for $12 (shipped) in the US from someone on eBay. I think it's about $12-$14 on Cool Mini Or Not. 2.) It softens with heat, so cold casting only. It's re-usable, you put it in hot water to soften it to a workable "putty", then press it around whatever you want to mold & let it cool. Looks like it's used mostly for press-molds with greenstuff or other modeling putties. From the reviews, nothing sticks to it, so no release agent is needed. 3.) Not sure how big a casting can be done -- I will experiment. Most of what I have seen has been small, one-sided objects. I think super glue would be too brittle. I may try 2 part epoxy adhesive for some small casts, though. I don't know if they are a re-seller, or the source or what, but that's about all I can find. As far as putties to cast with, rather than use the more expensive Kneadatite ("greenstuff") or Procreate (which I am starting to like better than greenstuff) I'm going to test out some of the hardware store putties. Quick Plastik is my favorite for bulking out larger forms. It's about half the price and usually available from most hardware stores. 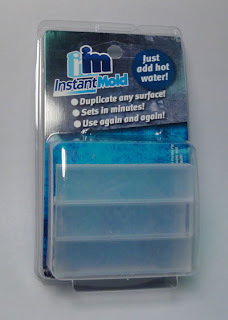 Thanks..I will give it a try...I don´t make much stuff with molds but I have a plan for one thing which wouldn´t involve heat and this looks perfect.